It’s a great way to advertise your business to MARVAC’s engaged Facebook fans (over 19,000 and counting) for FREE! MARVAC is updating the “coupon” tab on its Facebook page and giving members the opportunity to offer a special discount on camping, RV parts and services, or whatever you choose! Your coupon ad will run on the page through December 31. For more information or to request another form, contact Beth Monicatti-Blank at e-mail or call 586.752.6381. Michigan RV and Campgrounds is the official publication of the Michigan Association of Recreation Vehicles and Campgrounds. With 100,000 copies distributed annually at RV shows and Michigan Welcome Centers, and including targeted marketing to 25,000 consumers directly interested in the RV and camping industry, advertisers have a unique opportunity to feature their product or service in the go-to resource for camping consumers. Our full-color, 64-page magazine with five fold-out regional maps showcases a wide range of campgrounds, dealers, and suppliers in an informative directory, complete with graphic maps for each region. To receive advertising information on the 2019 issue, contact Katie Rollert at e-mail or call 231.946.3712. 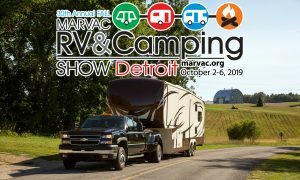 The consumer e-newsletter is sent to nearly 30,000 consumers who have requested a Michigan RV & Campgrounds directory, or have signed up for the e-mail list to receive additional information from MARVAC. This quarterly e-newsletter covers various topics concerning the benefits of traveling in an RV, places to visit, tips and more! E-promo ads are available for $215, which includes design and production. This is a great way to advertise a special promotion, or online discount and link to your company website. To advertise in the next issue, contact Katie Rollert at e-mail or call 231.946.3712. Marvac.org received over 300,00 visitors in 2017. Online ads are available in the form of banner, skyscraper, and square ads. For more information, contact Katie Rollert at e-mail or 231.946.3712. Online classifieds. Do you have a job opening to post, property or equipment for sale? MARVAC’s online classifieds is the best place to advertise. Association members pay $25 for up to 100 words. For more information, e-mail Lauri Brantley or call 517.999.6879.